A down payment on a house is one of the key first steps in buying and owning your own home. If you’re new to the housing market, you might be completely lost and not know where to start. Buying a house doesn’t have to be scary. As long as you come in knowing the basics, like how much payment is expected up front, how it will have an impact on your credit and more, you’ll be ahead of the crowd. For many prospective home buyers, the down payment is the most daunting hurdle in the race to buy a home. Even for people with decent credit and a healthy paycheck, the down payment can be the great homeownership killer. By definition, a down payment on a house is the money a home buyer gives to a home seller to lock in the home purchase deal. “It’s a myth that every home buyer must have a 20% down payment to purchase a home” says Beth Rello, a Manhattan Beach, CA, branch loan consultant at Caliber Home Loans. Rello also points out that “sometimes it’s better to explore less than 20% down options to see if they can get into a home sooner than if they keep chasing the 20% down. Many times it can be beneficial to look at less than 20% down options. So what’s the big deal about a 20% down payment? Because if you don’t, you might have to factor in private mortgage insurance (PMI) or government insurance, which is usually financed by the Federal Housing Administration. Like other kinds of mortgage insurance, PMI protects the lender—not you—if you stop making payments on your loan. PMI is usually required when you have a conventional loan and make a down payment of less than 20 percent of the home’s purchase price. If you’re refinancing with a conventional loan and your equity is less than 20 percent of the value of your home, PMI is also usually required. When you’re looking to keep your monthly payment as low as possible and have cash to spare. When you’re approaching retirement age and can envision a reverse mortgage sometime down the line. When the interest rate is lower with a higher down payment. “The more you put down, the better position you are in for negotiating a lower interest rate,” says Credit.com. If you’re worried about being underwater. If the market should drop in your area, you run the risk of owing more than your home is worth. When you don’t have the funds for a higher down payment and can’t earn or borrow them quickly enough. When the rate on your FHA or Fannie or Freddie loan is comparable to that you’d get with a higher down payment. When you need to escape a high-rent situation and the monthly payment on a house is lower than what you’re currently paying, even with the PMI factored in. 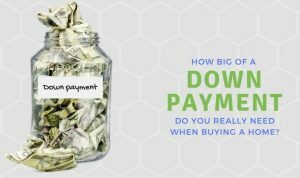 How Much Should Your Home Down Payment Be? The size of your down payment on a house depends upon multiple variables, including your personal financial situation, your age, your marital status, your income, your credit health and how much you’ve been able to save a home purchase. Americans don’t usually put down 3.5% or 20% on a home purchase. In 2018, the average home down payment as 13% according to the National Association of Realtors. Younger home buyers aged 35 and under, who usually have lower incomes than people in their 40’s and 50’s, put down 8% on average for home down payments in the same time period. When you’re figuring out how much you aim to save for a home down payment, know that it’s perfectly acceptable to steer any cash gifts from friends, family or business partners toward a down payment. Setting aside any workplace bonuses or financial windfalls (like an inheritance) can also curb the impact of having to save money for a down payment. To calculate exactly how much you’ll need for your down payment, use a good online mortgage loan down payment calculator app to see where you stand before you make home purchase offers. What Happens When a Homeowner Dies Without a Will?